This week we heard the news that CCP Games will be officially shutting down PS3 online shooter DUST 514 in May to start work on a PC reboot. While this is obviously disappointing for the small but dedicated community that has stuck with the game over the years, it’s a predictable end that we always knew was coming and the prospect of a PC reboot is interesting. DUST 514 was an incredibly ambitious game that aimed to merge EVE Online‘s spaceship warfare with planetary conquest on the ground in realtime, but it never managed to harness that potential. We got very limited forms of cross-game communication and a barely useful orbital bombardment mechanic, and the core FPS gameplay wasn’t compelling enough on its own. The new reboot is in the very early development stages and is being built from the ground up on Unreal Engine 4, so we probably won’t be getting our hands on it any time soon. By the time it does arrive, there’ll be several more first person shooters on the market and it may be competing with games like Destiny and Star Citizen on first-person gameplay. CCP will have to do something unique and compelling with the new FPS to make an impact, and that means playing on EVE‘s main strengths as a single-shard sandbox MMO with intense wars and community politics. For the new FPS to be a success, it will have to be much more tightly integrated with EVE. In this edition of EVE Evolved, I look at why DUST failed in its execution on PS3 and what kind of gameplay and features I think the reboot needs to be a success. Why did DUST 514 flop? The warning signs for DUST 514‘s failure were apparent long before the game was released, starting with the announcement that it would be a PlayStation 3 exclusive. The online backlash to this was pretty severe as the console was already reaching end-of-life and existing EVE fans weren’t guaranteed to have one. CCP’s Chief Marketing Officer at the time, David Reid, imagined “tens of millions” of gamers flocking to the EVE universe via PS3 and said that “EVE could be the biggest game in the world at the end of 2012″. These numbers made no sense even at the time and seemed to be just plucked from the ether. In the end, DUST proved to be as niche a game as EVE itself was at launch, settling at an average concurrency of only 2,000 to 3,000 players. It didn’t help that the game launched in a highly unfinished state with very little compelling MMO gameplay of its own and only a tenuous link to the EVE universe. 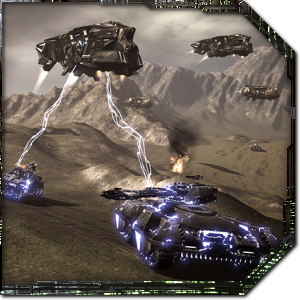 The marketing for DUST sold the idea of huge battles raging simultaneously in orbit of a planet in EVE and on the ground in DUST 514, with ships firing orbital strikes at the ground and ground batteries firing at ships in orbit, but it never happened. For most players, DUST was just a poor lobby shooter with the unique and not-so-compelling twist that you lose gear when you die. The years since launch have actually been quite kind to DUST 514 as developers have revamped everything from weapon balance and itemisation to planetary conquest, but several major features were cancelled when Legion was announced in 2014 and freemium features like Warbarges weren’t universally well received. The player numbers have remained relatively steady and CCP described the game as profitable back in March 2015, but it could never be significantly linked to EVE with such low player numbers and the PS3 is now very much dead as a future platform. CCP had no choice but to port the game to other systems or let it slowly die and start to drain resources, so a PC reboot definitely seems like the right way to bring this game back to life. One of the big sticking points I had with DUST 514 is that it felt like more of a lobby shooter with destructible gear than an MMO, and I think that’s because planetary conquest was so crap. Planetary districts were these abstract icons on a bit of UI rather than actual industrial infrastructure on a planet, but it doesn’t have to be that way. A PC reboot means developers no longer have to cater for console controls and patching limitations, so the new DUST 514 could be be updated right alongside EVE and both games could use similar user interfaces, graphics and even gameplay in places. This opens the possibility of DUST players having access to the same planetary view that EVE players currently use for planetary industry. Imagine if DUST players could build structures on any planet in the galaxy just like EVE players can, and if every Command Center, Storage Facility, or Extractor on a planet could be conquered or raided through a real ground attack. Each type of building would become an individual map in the game with a particular objective to win the match, such as capturing points or destroying something. New PI buildings could be added for manufacturing and storage of clones, battle suits, weapons and tanks to be used when defending your structures on the planet from attack. DUST players could be allowed to buy and sell PI products, clones and equipment on the actual EVE station marketplaces in the same star system, with free Interbus transports shipping items to and from the ground facilities. Once DUST marines can engage in any kind of planetary industry they like, they can produce a profit via direct trade with the EVE economy and EVE players can produce clones and ground equipment if it becomes more profitable. If the game economies are linked as above, there’s an implicit profit motive behind attacking and defending planetary structures. Ground-based infrastructure could simply be given a vulnerability window of a few hours per week just like EVE structures, during which time anyone with a command center on the same planet could initiate an attack. 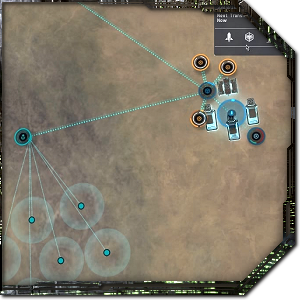 The player would have 30 minutes notice of the attack while the enemy War Barge is moved into place above his infrastructure, and then the match would kick off. 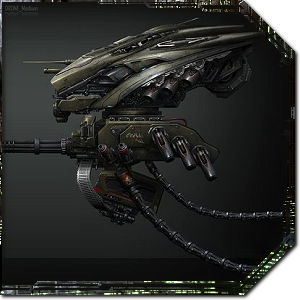 Both the attacker and defender would be limited to using only the clones and equipment they have stored on the planet, so an attacker would want to build up a war-chest before attacking or import supplies from EVE. All battles over planetary infrastructure could be open to the public by default and show up in a lobby list so that random players can join on either side, but both the attacker and the defender could optionally limit this to just their corporation or alliance. Both sides could offer access to their stockpiles of equipment to those who help and even set mercenary payments for each kill and for victory. Attacks on command centers could be full-on capture events that might last until the end of the vulnerability window, and the winner would then own the command center and all linked structures. Attacks on storage structures could be smaller raid events where the winner just has to get inside the building and hold it while the stored equipment is stolen back to his own base. In addition to both games’ economies being linked together via a shared marketplace and planetary industry gameplay, what the reboot really needs is battles that happen both in DUST and EVE at the exact same time and in which each side can affect the other. 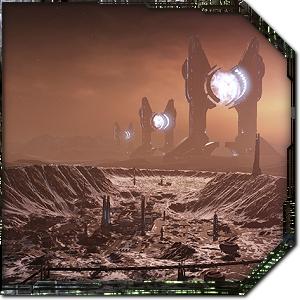 In the above example, both the attacker and defender have a command center on the planet’s surface and storage for clones and equipment, so what if both sides launched a War Barge that was visible in EVE? 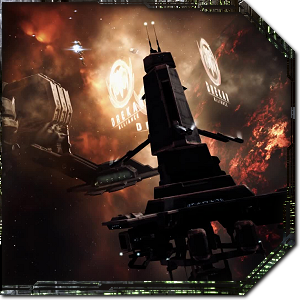 When the DUST attack begins and the 30 minute countdown commences, both the attacker and defender’s War Barges could appear in EVE in low orbit over the target location. The barges house the respawn mechanism for new clones during a battle and direct the drop ships to deploy vehicles. If one is destroyed in EVE then it should explode in the DUST battle and the side that lost it should be unable to respawn or drop vehicles for the rest of the match. The war barges could also drop 5-10% of the attacker or defender’s war stockpile as loot as a small incentive for random EVE players to get involved, but politics and alliances should take care of this nicely. Instead of random EVE ships delivering air strikes, the War Barge ship itself should be boardable from space and air strikes would be delivered via its attached weapons with a several-minute cooldown. The War Barge could easily be handled using the new Citadel structure system and could be about as powerful as a carrier in EVE so that it can defend itself from random passing players but a small gang should be able to take it down. It’d also be amazing if the pilot could watch or direct the battle on the ground via a Battlefield-style commander interface, but this may be a considerable technical challenge so I wouldn’t count on it happening. The core of DUST 514 has always been PvP, but one of the big features people looked forward to that never materialised was a PvE or co-op game mode. The original plan was to have the player face off against Rogue Drones invading various instanced planetary districts and then they’d salvage the drones for materials at the end of the match. There’s no reason that this couldn’t fit in with the plan above, with planetary industry being a passive way of collecting materials and building equipment and the PvE mode being an active way of collecting it. Most of us EVE Online players dismissed DUST 514 as a failure, but it’s important to recognise that it has a dedicated community with its own alliances, culture, blogs, and podcasts. If it had been released on PC, it may have grown organically in a similar manner to EVE in its early days and perhaps it would have PvE and closer interaction with EVE Online. The developers have learned a lot from developing DUST 514 and EVE itself is in a much better position to support closer integration, so we can only hope that this is CCP’s plan going forward and planet ownership will eventually play an important sole in sovereignty warfare. All eyes are now fixed on this year’s EVE Fanfest in April when we’ll find out more about what the future holds for boots on the ground in the EVE universe. Nyphur Kaloth I’d love to see what you come up with when you get the chance. I don’t usually do much gang play as it’s hard to find active folk in my timezone, so for now I’ll leave any further fit ideas to the experts and go back to roaming null & J in my hound. Kaloth Nyphur I wouldn’t use an MAPC on anything larger than a frigate, if you’re off by so little powergrid then you can just install a 1-3% powergrid implant or find another way to fit it (drop an ion blaster to electron, for example). If you absolutely have to use a fitting module for powergrid on a shield ship then make it a Power Diagnostic System for the shield bonuses too. For the ‘Rax I wouldn’t shield tank for this purpose as it really needs at least 3 mids for MWD, point and web and a 1-module shield tank isn’t really worth it. A large extender and a T2 invulnerability field would be your ideal tank so you’ll only have one mid free for tackle and can’t waste it on a grappler since that leaves you without a scrambler. An 800mm armour plate tank is typical and lets you use the fourth mid for a tracking computer, an extra web, or to have a short-range warp scrambler to knock out MWDs/MJDs and a long-range disruptor to get a point on someone while closing in. I’ll have to play around with fittings to see if I can free up 200 grid on something that small, but that will probably mean dropping the plate entirely and switching to a full gank setup. A small group of full shield thoraxes each with either a grappler or a long point could be useful for chasing down kiting ships as the shield setup will be very fast with an overloaded MWD and the grappler gets more effective the closer you get. Since the grappler reaches 85% web at point blank range, you wouldn’t need a scrambler to stop an MWD frigate, just 2-3 grapplers latched on and closing in. Nyphur Kaloth This is what happens when you run out of fun stuff to train, you train crap you never use. I had no idea about the RR bots. Thank God I can un-train that junk in a couple days. Personally, I don’t mind the ec-600’s, there’s enough being used that it will at least mess with whoever you’re on trying to take. But for those like you that prefer some more DPS, Hammerheads will probably be of more use than the Vespas I’ve included in the link above–especially as they will not need to chase after the target. Let me know if you see a flaw in the fit, or if you can think of a better way to get it done. Kaloth Nyphur Blaster ships did get shafted when webs dropped to 60% strength, maybe this will help. The Thorax or Brutix could fit one but you might end up sacrificing the plate to do it as you definitely want an MWD on a tackle Thorax. You also can’t use remote repair bots on yourself and I find ECM drones are unreliable, so I’d definitely use damage drones. The fact that the grappler is more effective than a web when inside scram range and still has limited effectiveness out to warp disruptor range is pretty interesting. A gang of MWD blaster ships like the ‘rax might get away with using long-range points since they can web almost anything inside scram range into oblivion. It’ll be interesting to see how people use them. 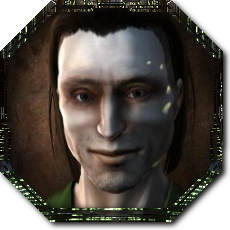 Nyphur Kaloth True about multiple webs, I blame lack of caffeine for lack of foresight. Maybe it will have a use for cruiser tackle–as in stick it on a cruiser. Like you say, they’re kind of useless the further away your target gets and a BS isn’t following anything anywhere. A quick look at Pyfa and I can see it fitting on a tackle thorax quite nicely. 801m/s, 485dps (out to 1.88km+5 because who needs range with a grappler), ~18.5k hp, and a spare mid with over 200pg left to fit the new module. Wouldn’t be worth jack for tackling anything small, but if you’re hunting BS it will lock it down tight. You can even fit some ec-600’s if you really want to be a jerk, some shield repair bots if you’re worried about shield regen while killing your prey, or failing all that, some valkyries would add a nice bit of dps on top of the guns (~129dps). There’s probably better options, but looking at it with fresh eyes this morning I can see it’s got some good potential for pvp. Yeah well the best thing they can do is making EVE and Legion (or whatever it will be called) …simply EVE online, one single game. Kaloth You can stack multiple webs to instawarp freighters anyway, so I can’t see that being very much use. On the surface, Heavy Grapplers seem like they could help battleship gangs deal with cruiser fleets and kiting ships, but the falloff combined with stacking penalties will be too harsh so the effect will be minimal. You’re talking less than 10%-20% speed decrease at kiting ranges even with 6-7 webs on the target thanks to stacking penalties. God knows we need something to make battleships worth using again, but this isn’t it. Pashgan Sure they should do that. Problem though – CCP doesn’t have the developmental talented to pull that off.